WANDERERS is a short science fiction film by Erik Wernquist – a digital artist and animator from Stockholm, Sweden. 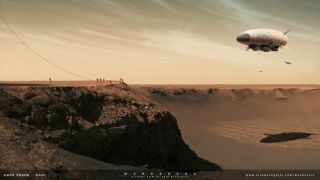 This image from the film makes use of photo taken by NASA’s Opportunity Mars rover and provides true landscape while adding in future Red Planet expeditionary crew. "Wanderers" is a short science fiction film by Erik Wernquist – a digital artist and animator from Stockholm, Sweden. Wernquist notes that the film is a vision of humanity's future expansion into the solar system. Although admittedly speculative, the visuals in the film are all based on scientific ideas and concepts of what our future in space might look like, if it ever happens. Adding to the compelling nature of this video is the narrative voice of astronomer and author Carl Sagan. The audio used are excerpts from Sagan's own reading of his book 'Pale Blue Dot: A Vision of the Human Future in Space' (1994). Leonard David has been reporting on the space industry for more than five decades. He is former director of research for the National Commission on Space and is co-author of Buzz Aldrin's 2013 book "Mission to Mars – My Vision for Space Exploration," published by National Geographic, with a new updated paperback version to be released next year. Follow us @Spacedotcom, Facebook or Google+. Originally published on Space.com.